This week’s Ask Dr. Geier Column addresses one of the most common concerns I hear from readers and listeners – continued knee problems after surgery for a meniscus tear. Are swelling and stiffness after meniscus surgery common, and what can you do to treat or prevent them? I tore a meniscal in my right knee about 4 years ago. About 12 months later I went for keyhole surgery to sew it up. Years later I still seem to be having problems with swelling and stiffness after sports or physical activities. I am a very active sportsman. My physio has said its loose cartilage in the knee. I was just wondering if you have any recommendation or advice on how to clear this problem. For the past 18 months, I have been taking a glucosamine sulfate supplement as advised by my physician. This is a tricky question, as not all surgeries for a meniscus tear are alike. Some meniscus tears are located near the periphery of the meniscus and occur in a certain orientation, so they can be repaired. Rehab and recovery from a meniscus repair surgery is very different from the more common procedure – a partial meniscectomy to trim out the torn portion of the meniscus. 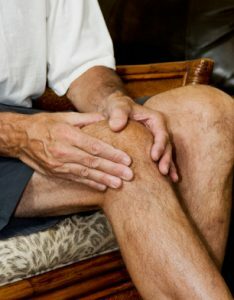 Another factor that affects recovery is the presence of any coexisting arthritis within the knee. Often an older patient with a degenerative meniscus tear has damage to the articular cartilage. Arthritis complicates the decision to undergo partial meniscectomy surgery, as it can be difficult to know if the meniscus tear or the osteoarthritis causes a patient’s pain. The presence of degenerative changes in the knee can be one of the main causes of persistent symptoms, like swelling and stiffness after meniscus surgery. Pain, stiffness and swelling with activity can remain, or develop, in the months and years after surgery. The challenge in a patient with wear and tear of the articular cartilage is finding a remedy. Orthopedic surgeons have no real way to make cartilage new again. “Cleaning up” the damaged cartilage at the time of the meniscus surgery might make it smoother, but it doesn’t provide much long-term benefit. Other treatment options really aim to treat symptoms rather than the underlying problem. Physical therapy, anti-inflammatory medications, glucosamine and chondroitin, cortisone injections, viscosupplementation injections, braces and activity modification are all options to decrease pain and other symptoms. Talk to your doctor before surgery to discuss ways to prevent swelling and stiffness after meniscus surgery. Do you need surgery for a meniscus tear?